Reception for the Artist, Thursday, April 1, 7 – 9 p.m. The Fahey/Klein Gallery is pleased to present "Trust," a series of new photographs by renowned Rock and Roll photographer Jim Marshall. For the first time, Marshall shares images from his archive of color photographs – many which have never been seen. Published in his recent book of the same title (Trust, Omnibus 2009), the title refers to Marshall’s notion that having the artist’s trust is what led him to be able to take such revealing photographs: "I feel that in my photographs there is a trust given by the artists. When I point the camera at somebody, there's a covenant, and I will not violate that trust." 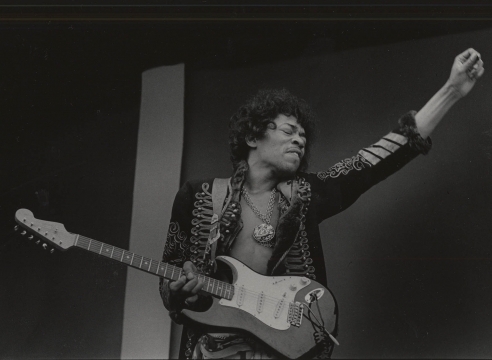 Jim Marshall's photographs from the 1960's and 1970's are the most memorable of the era. With work covering everything from what may have been Otis Redding's last major performance at the Monterey Pop festival before his untimely death, to his iconic images of Bob Dylan pushing a tire down the street, Janis Joplin lounging backstage, and Johnny Cash flipping the bird at the lens, Marshall has been one of the best “musician” photographers. He penetrated their world and not only became an eyewitness, but a friend, comrade, and conspirator. “Trust” is the evidence of a lifetime of rock and roll. Having worked on innumerable assignments for periodicals, including Rolling Stone, Life, Saturday Evening Post and Newsweek, Marshall is also responsible for more than 500 album and CD covers. He has co-authored and collaborated on such publications as Early Dylan (Bulfinch, 1999), Not Fade Away (Bulfinch, 1997), and Monterey Pop (Chronicle Books, 1992). His work has been published worldwide and is included in the permanent collection at the Smithsonian.